If you’re going to be spending any amount of time in Spain, chances are you’ll end up at a supermarket, whether for a late-afternoon snack or ingredients for dinner if you’re cooking for yourself. 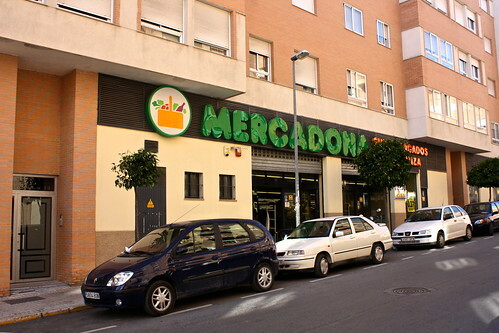 And when you do end up going to one, you’ll inevitably experience culture shock since some customs in Spanish supermarkets are a bit different from those you may be used to. 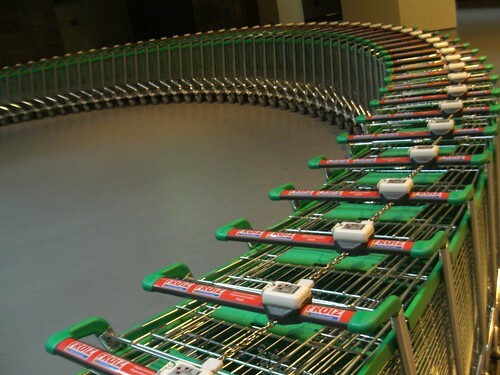 You won’t be falling on the floor in shock over them, but if you’re aware of these small but significant differences in the way you go about doing things, your shopping trip will go much more smoothly. At the entrance to most supermarkets there are always a couple dozen cubbie-hole-sized lockers for you to stow your backpack/heavy belongings/shopping bag from another store in. This is nice because you don’t have to lug your crap around with you all over the store, but the lockers are probably there to prevent shoplifting, so make sure to lock up your large bags before shopping or the cashiers and/or security guards at the front will yell at you. It’s pretty simple: just find an empty locker, open the door, stuff your bag inside, drop a 50-cent, 1-euro, or 2-euro coin piece inside the slot, close and lock the door, and remove the key. In a big change from American stores where the cashier punches in the code and weighs your produce at the checkout, in Spain you bag your fruits and veggies and take them to a central scale where either you or an employee weigh your items and print out a little sticker with a barcode to put on your plastic baggie. Then you take these pre-priced baggies to the checkout lane where the cashier can fly through them like they were any other item with a barcode. Let’s say your groceries cost, say, 15,02€, and you hand your cashier a 20-euro note when it’s time to pay up. I would be willing to bet that 20 euros that they would ask you if you happen to have two cents so they can instead give you ten- and five-euro notes—because otherwise, they’ll have to crack open a roll of pennies and leave you a pile of metal including a 50-cent coin, two 20-cent ones, a 10-, a 5-, and two 2-cent pieces. What a mess. So if you happen to have change with you (and you should, since you’re carrying it around in your pocket-sized coin purse like it’s the manliest thing since the Euro man-purse), everyone involved will have a much better day. This isn’t restricted to just pennies, though; if your ingredients to make tortilla add up to 6,37€, you can hand over a ten-euro note and a one-euro coin to get a pretty, green five-euro note back with much less spare change. This is definitely my least favorite part about buying groceries in Spain. The cashier will usually ask you “¿bolsa, quieres?” (“you wanna bag?”) and you have to estimate if you can stuff all your crap into a single bag or just pay another 10 cents for a second one. Then, as the cashier is passing your items over the scanner and pushing them to the end of the metal bagging area, you have to frantically cram your groceries, toiletries, and baguettes into the precious plastic bag(s) you just bought all the while racing against the mounting avalanche that is your shopping trip. Rarely will you finish bagging before it’s time to pay, so while the cashier is giving you your change and everyone else behind you is staring you down, you’ve got to finish bagging everything under pressure and peace out. Bonus: Don’t forget to say bye to your cashier on the way out! An “¡hasta luego!” is just good manners. 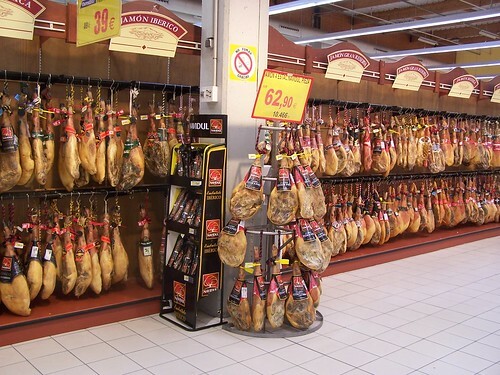 Have you ever experienced culture shock in a supermarket—in Spain or elsewhere? Add your story to the comments section below!